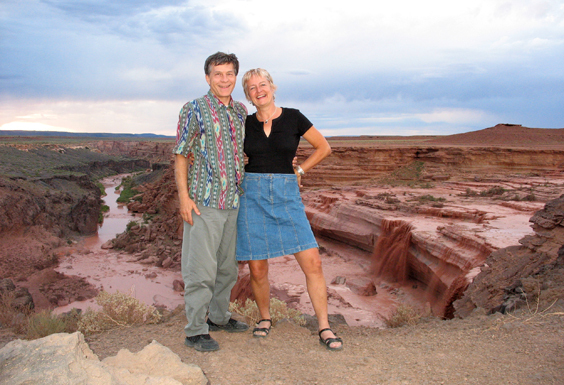 For our "honeymoon", we trekked north to "Niagara Falls" -- Arizona's own magnificent and mysterious Grand Falls on the Little Colorado River. 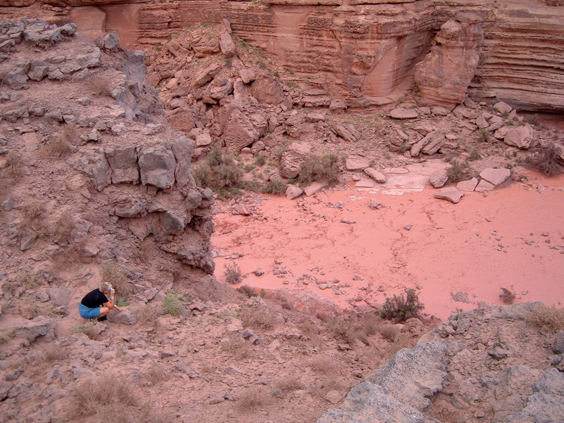 The falls is on the Navajo Reservation northeast of Flagstaff, and many are the web sites that warn you that outside of spring runoff, the falls is "just a trickle." 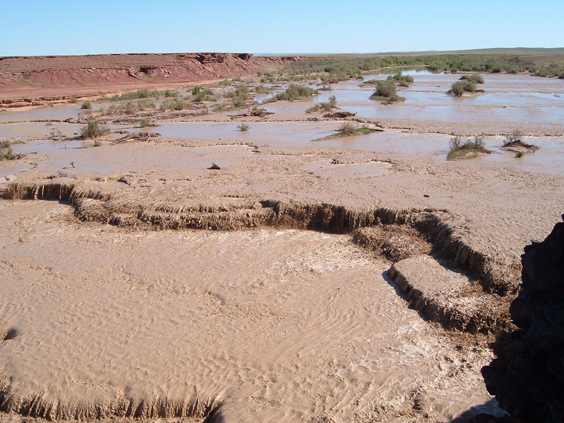 But 2006 hasn't been an average year, with the sixth wettest monsoon in recorded history as of this writing. Passing through the High Country on Route 87 north of Payson we encountered torrential rains and even some granular snow -- quite a change from torrid Tucson! In lowering light under troubled skies, the falls was a wall of tumbling tomato juice. The Little Colorado River drains virtually the entire backside of the Mogollon Rim, from the New Mexican Border to the Grand Canyon. 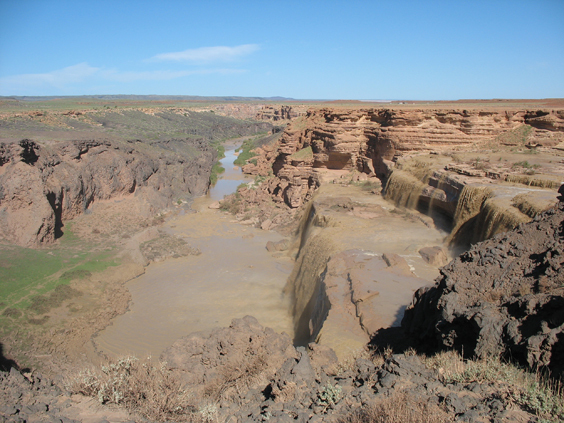 It picks up plenty of sediment from the soft Kaibab, Moenkopi and Coconino sandstone before slamming into a basalt river from the San Francisco volcano field and plunging approximately 185 feet to the canyon floor. We revisited the falls on our way back to Tucson and found both the color and the volume radically altered after several days of heavy rain. 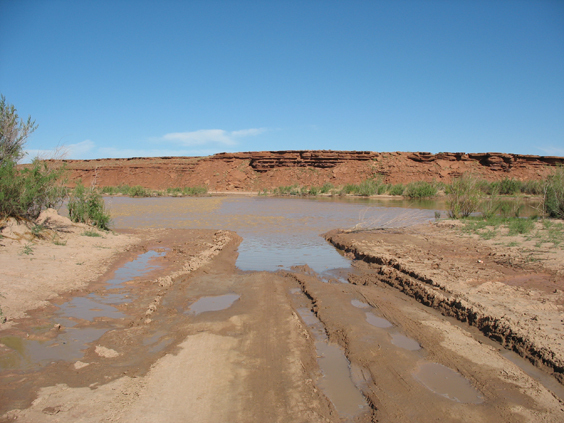 Indian Route 6910 runs smack into the Little Colorado, but gives no hint of one writer described as "a violent chocolate milkshake" a stone's throw downstream. 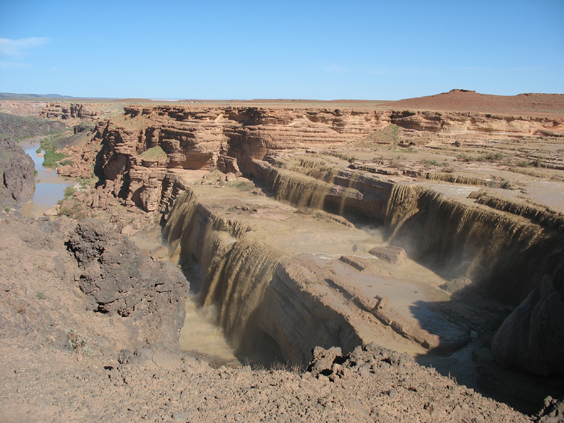 For more great photos of Grand Falls, visit Flagstaff Central. As evening approached we found ourselves within 10 miles of Merriam Flight Park, where Dennis learned paragliding. 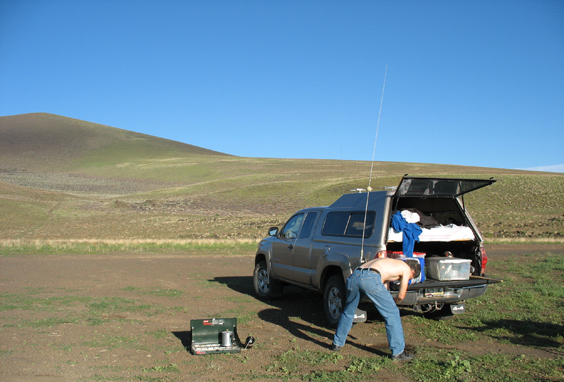 We called and obtained permission to camp in the park, and took the opportunity to see the world from the top of 6300' Merriam Crater. The trail to the top was almost too steep to walk. That Taco Ma is a tough little gal! Dennis gets his morning shower from a five-gallon jug on the tailgate. We are totally self-contained, with a foam mattress on two half sheets of 3/4" plywood, and all our gear stowed under the bed. 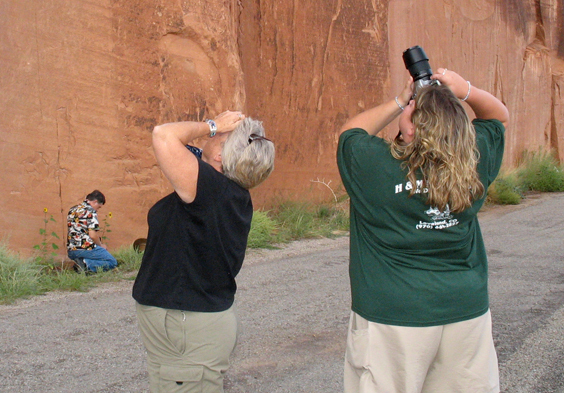 After a thrilling tour of First Mesa and Walpi, we took advantage of free camping in the tribal park at Canyon de Chelly. 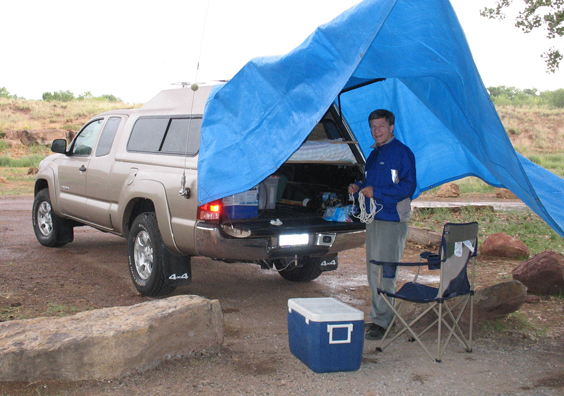 The foul weather canopy is a good concept but needs a bit of refinement. 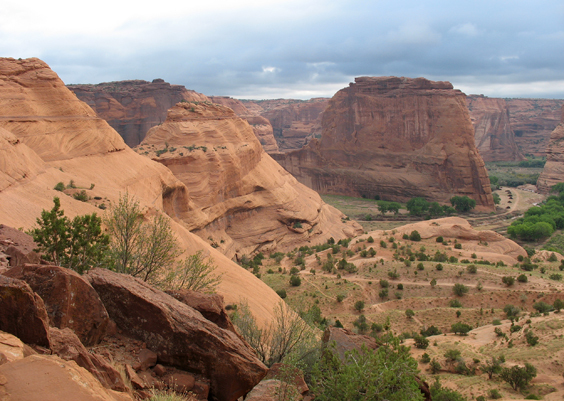 We squeezed in an early morning hike between rain showers to White House Ruins in Canyon de Chelly. 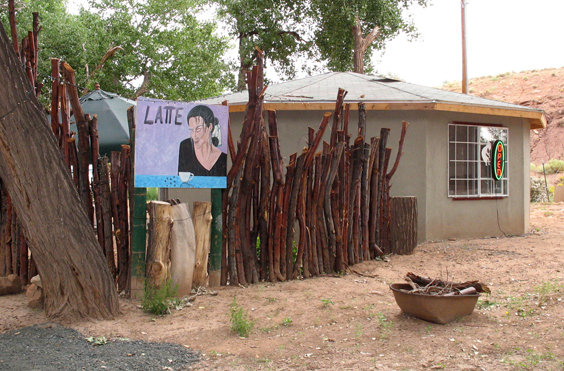 Changing Woman Espresso is still the best coffee stop within many miles. This year they've added a prefab hogan and a stockade, but choices are still somewhat limited (cups were optional, for example). 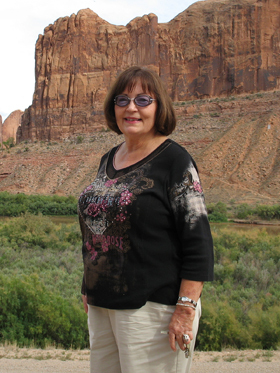 From Chinle we headed north to Moab along the always scenic Highway 191. Other members of the McDonald Clan trickled in from Denver, Colorado, and Hastings, Nebraska, and we all got together that evening at Sorrel River Ranch for a most enjoyable outdoor concert. We met again for breakfast at Mondo Café -- my favorite! 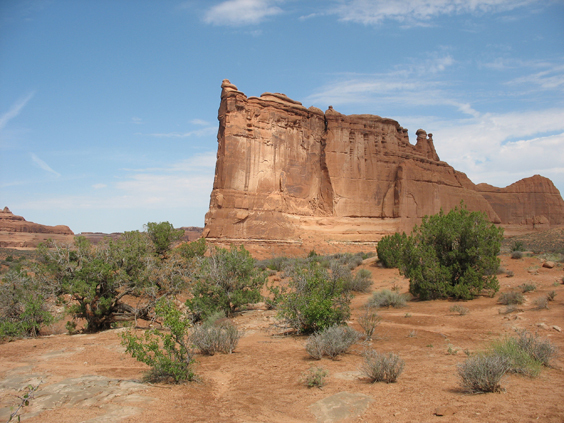 Then it was off to do the things you do in Moab, like photograph the wonderful rock formations in Arches National Park and petroglyphs on cliffs above the Colorado River. Dennis, Frankie, and Frankie's daughter Ronnie Halsey. 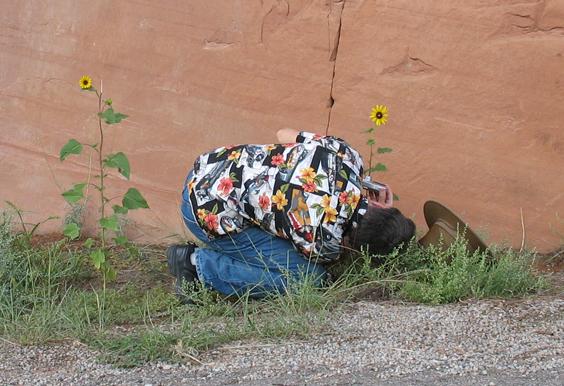 Dennis stands on his head to get just the right shot. 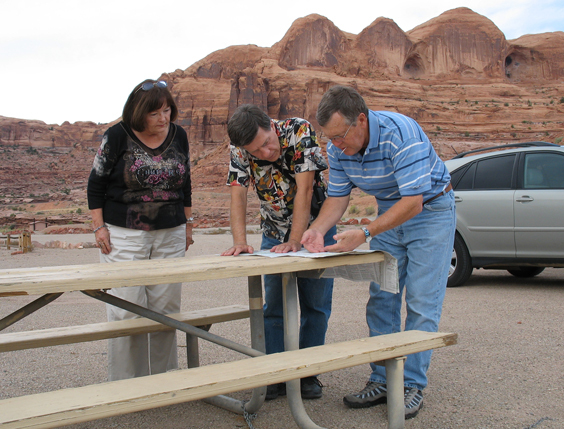 Jan, Dennis and Jim O'Keeffe plot our route back to Tucson. One last look at the Colorado River. 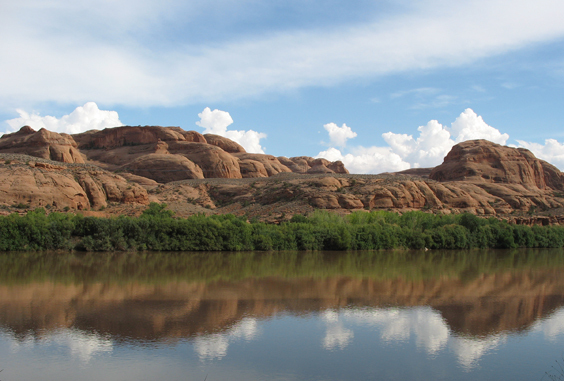 A float trip on the Green or Colorado River is definitely on our calendar! 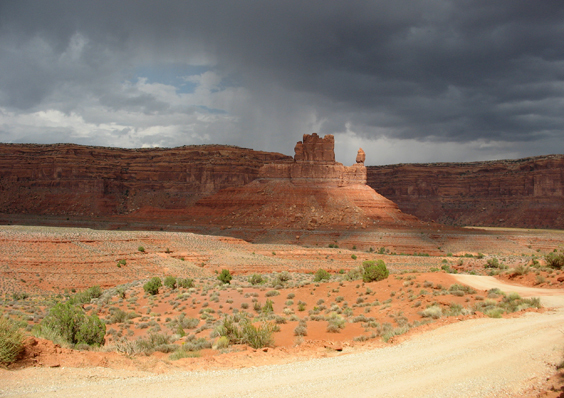 If you're travelling in southeastern Utah, a detour via Routes 95 and 261 is highly recommended. 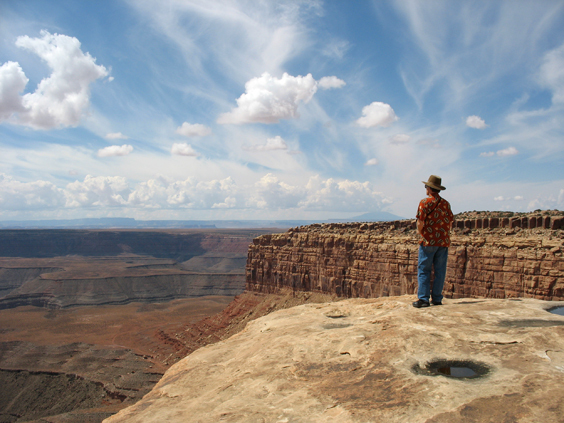 This is glorious high mesa country dotted with dozens of Indian ruins and unusual geologic features. Butler Wash Ruins, a mere 1/2 mile from the highway, was one of the highlights of this trip. Known as the Ballroom Cave Complex, the cliff dwellings in Butler Wash were built and occupied by the Anasazi in about 1200 AD. 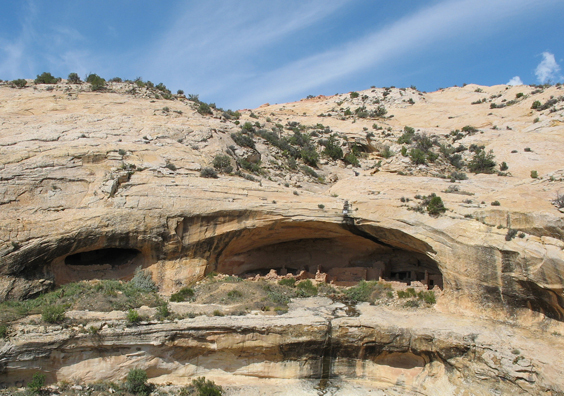 There are habitation, storage and ceremonial structures, including four kivas. I was most impressed by the very defensible location at the head of a steep canyon, and "running water" provided by a stream that trickles across the roof of the cave and out the front door! We followed the stream a short distance and discovered that it flowed through a very impressive natural aqueduct from a series of catch basins in the smooth rock above the cliff dwellings. We continued up and over Comb Ridge, which slices across the mesa from north to south, very much like the Cockscomb and Waterpocket Fold farther to the west. Lunch time found us overlooking the San Juan River at Muley Point. 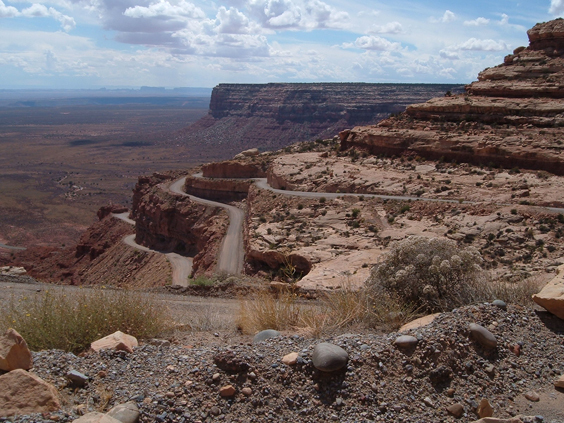 Route 261 drops more than 1000 feet from Cedar Mesa to the San Juan Valley via a series of tight hairpin turns known as the Moki Dugway. Drawn by distant glimpses of myterious hoodoos and banded monoclines, we took the 17-mile loop through Valley of the Gods. 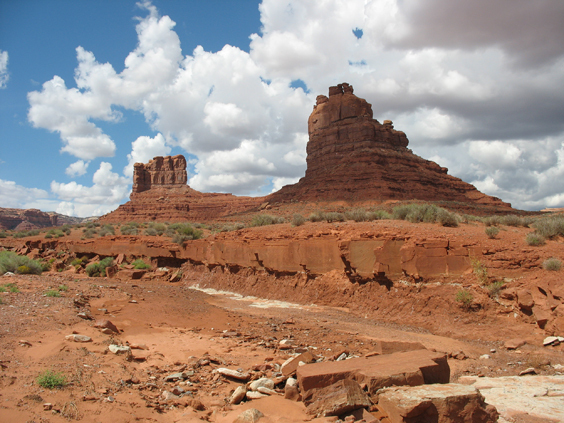 The tortured spires and blade-thin towers in this valley delivered everything we ever looked for (but never found) in Monument Valley. 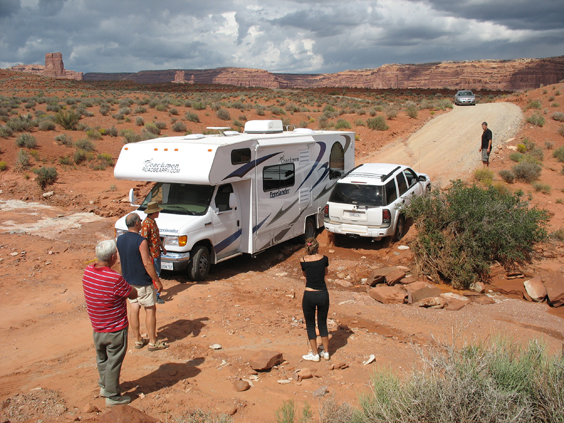 With another storm brewing on the horizon, we found ourselves in a "traffic jam" caused by an Italian couple stuck in the bottom of a wash with a giant RV, no shovel, no jack, no English and no clue. To their aid came an international team including another (unrelated) Italian couple, a German, a retired couple from Awshucks, Idaho, and us. With some French and a lot of gesturing, we convinced them to stop gunning the engine and try lightening the back end and digging out the front tires. It took over an hour, but eventually the Italians rumbled off into the sunset with their RV intact and a great story to tell. 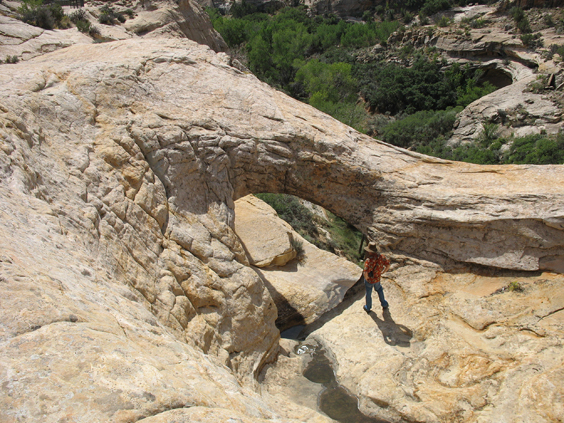 The last stop was Goosenecks of the San Juan State Park, where the river makes an impossible number of hairpin turns in a short section of beautifully banded sandstone. 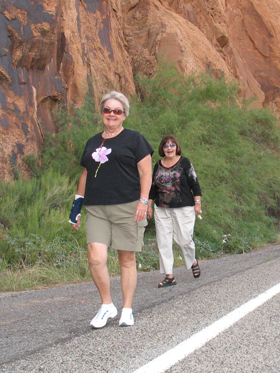 Then it was back across the res' through Kayenta and Cameron. Weary of the traffic on Route 89, we turned onto the Wupatki/Sunset Crater Loop Road, looking for a camping spot just outside the Monument. 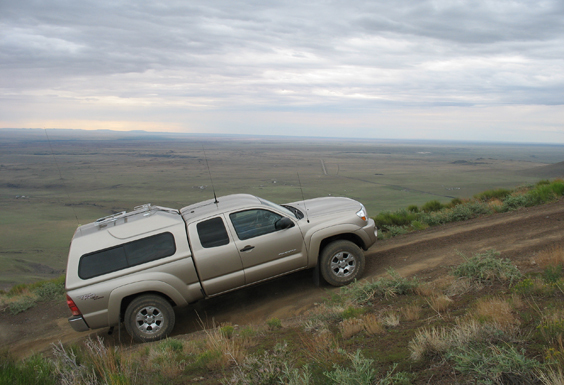 We ended up on FR 244, a two-rut road that rolls across the cinder cones and eventually drops into the Little Colorado River Valley near Merriam Crater. It was very slow going -- we didn't camp until 11 pm that night -- but we couldn't resist the soft descent through the sifting cinders and the sweet-smelling pine forest. I'd like to give this road another try in daylight ... if we can. Our friends at the Forest Service have announced plans to "rehabilitate" (meaning: "erase") Route 244 and all roads leading north from the craters.